Munich - With such international billing, an array of star players and last season's top two, it would perhaps have been a surprise had the Player of Matchday 13 not come from the Klassiker between FC Bayern München and Borussia Dortmund. What it perhaps more surprising is that it came from a man who only played for 34 minutes. Then again, that man is Mario Götze, who writes his own storylines, scoring the vital first goal against former club Dortmund to help his new Bayern team-mates to a 3-0 victory. 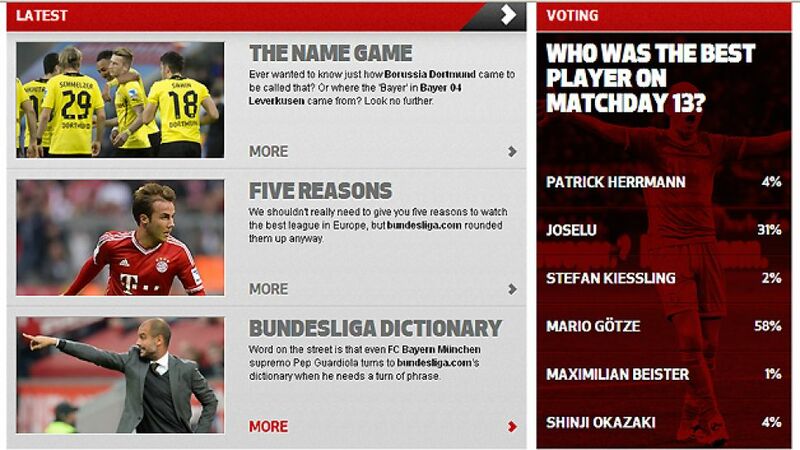 Such an influential display garnered Götze 58 per cent of the Player of the Week vote from bundesliga.com readers. One moment likely swung the vote the 21-year-old's way. Picking up a Thomas Müller cutback on the edge of the box in the 66th minute, Götze needed no time to think, reacting instantaneously to revive the art of the toe-poke and fire his low effort past Roman Weidenfeller. It was a goal to shatter Dortmund hopes and hearts. Götze's performance meant that despite his first two goals for the club - and stunning they were - Eintracht Frankfurt's Joselu came in second place with a similarly impressive 31 per cent of readers' votes. At 2-1 to the visitors, it was a tense affair between the Eagles and FC Schalke 04, but the Spaniard's first goal, an excellent looping header was then bettered by his next strike. Chopping inside, Joselu unleashed a viciously swerving drive into the far corner to make it 3-2 to his side. Although Schalke hit back to equalise late, the 23-year-old's efforts weren't forgotten by our readers. With four per cent of the vote each, Patrick Herrmann and Shinji Okazaki fell in behind Joselu. Herrmann inspired his Borussia Mönchengladbach side to their second successive away win with a pair of assists. He set up Raffael and Oscar Wendt who scored in a 2-0 win over VfB Stuttgart. Okazaki was just as crucial as 1. FSV Mainz 05 held on for a 3-2 victory against SV Werder Bremen. The Japanese striker showed his predatory instincts in both halves to bag a brace, a feat he never achieved for former club VfB Stuttgart, giving Mainz a vital three points. Stefan Kießling picked up two per cent of the vote thanks to his clinical display in Bayer 04 Leverkusen's 1-0 win over Hertha Berlin. He needed just one shot to register his eighth goal of the season - and take his side into second place. Finally, Maximilian Beister finished with one per cent of the vote, despite a customarily electric performance from the right flank which he crowned with a goal, in Hamburger SV's 3-1 win over Hannover 96.